Oberwerk's Ultra 15x70 binoculars have big beautiful prisms and produce a relativly small, very bright exit pupil. Glance at the eyepiece end of the Oberwerk Ultra 15x70 binoculars, and you get the strong impression that WALL-E, the Pixar robot character, is looking back at you. The large eyepieces appear closely set against the "brow ridges" of the Porro prism housings. Look through those eyepieces, and you'll get the feeling the universe is looking back — bright, sharp and maybe just a bit curious about you. It's a powerful sensation. At 5.5 lbs. (2.5 kilograms), the Ultras are heavy. 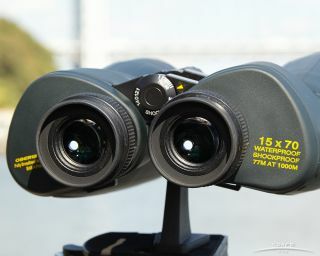 At nearly 11 inches (28 centimeters) long, they are, indeed, on the big side for intermediate binoculars. We included them in our Medium category because you can handhold them for short periods; they balance well. Oberwerk provides a cushioned strap to throw over your head, so clearly, the company thinks you can, too. At 88oz. and 11in., Oberwerk's Ultra 15x70s are more than you want to hand-hold. But put them on a tripod or counterweigted arm and they will launch you into the sky. The Double Cluster in Perseus (NGC 884 + NGC 869), which contains a few hundred bright-blue supergiant stars, looks spectacular through these Ultras. If you live in — or can travel to — the Southern Hemisphere, the dwarf galaxies known as the Magellanic Clouds are just about the perfect targets for this set of glass. Each eyepiece focuses separately (just as you'll find in giant binoculars of the superheavyweight astronomy and "border patrol" class). And in those "focusers," you'll find well over 300 degrees of finely machined adjustment range. These felt well damped and "heavy" at room temperature. I was concerned they might be hard to move on a cool night, but that wasn't the case. Whatever lubricant is used, the viscosity did not seem to change across the range of temperatures. Oberwerk's Ultra 15x70's eyepieces (oculars) each focus independently. Characteristic of large astronomy binoculars, there is no center focus ring. As an eyeglass wearer, I bumped my lenses up against the Ultra's eyepiece guards a few times, trying to optimize the view through the "exit pupil." No problem. I just had to fold the guards down, as expected. But, after removing my spectacles (in a vain attempt to recover my lost youth), I got a nice surprise: I found I could focus these binos extremely well without additional correction. If you are nearsighted, this trick may not work. Objects on the sky are, effectively, at "infinity distance"; you may not be able to get any binoculars to fine-focus them without your prescription glasses on. Technically, I have a hyperopic astigmatism, meaning I'm farsighted and point sources, like stars, can come to focus at two points, slightly separated. But these Oberwerks managed to give me sharp star points, and somehow attenuate one of the virtual images — at least to the point where my brain could do the rest. I perceived a very flat field, with no "unauthorized binary stars." I'm guessing this is due to Oberwerk's unyielding quality control and attention to superior lens coatings. Some (cheaper) competitors' binoculars can actually introduce astigmatism. That's something nobody needs, no matter how much money they saved by buying cheaper binos. Among consumer-level binocular distributors, only Oberwerk and Barska provide detailed instructions for aligning their binoculars. (Celestron, for example, insists that you're not smart enough to do this yourself. You must contact Celestron Tech Support.) Oberwerk refers to this as collimation, but it isn't exactly the same as collimating a reflecting telescope— in fact, it's easier. Prisms in all the Ultras float on a tri-point suspension. That's a more expensive (and superior) scheme than what you find down-market. Collimating is best done during the day, with the "binocs" mounted and focused on a building with 90-degree corners. You can access the setscrews nudge the Porro prisms: They're hiding under the 15x70's sleek green "wetsuit," but you can easily tweak them with a jeweler's screwdriver. Oberwerk's Ultra 15x70 can be hand-held for short periods on terrestrial targets during the day. But they're too heavy to hand-hold on the stars. That "wetsuit" says "waterproof" on it. But that's more of a suggestion than a promise. Rain, spray, splatter and dew will be no problem at all. But I wouldn't fully immerse them in salt water for very long, nor very deep. You will want to come up with your own scheme to store the rubber lens caps (two objective covers and one eye piece dish) or, one night, they won't come home with you. Your shirt pocket will do in a pinch, but over time, that can introduce a lot of dusty lint to the Ultra's exquisitely coated optics. Note that Celestron sells a similar-looking set of binoculars: the Skymaster 15x70. But it doesn't stack up or have specs in the same universe of quality. Objects appear roughly 15 times larger than your eye alone would see them. The large lenses on the front measure 70 millimeters (2.8 inches) across. These binoculars weigh a hefty 5.5 lbs.! You won't want to handhold them for long. Wider is better, but that's more important for things that move (e.g., birds, kids playing sports) than for astronomy. These aren't superwide, but magnification and contrast win out over field immersion here. You should expect to pay about $380 (+ shipping) after some comparative shopping. The only reason we rated these Oberwerks as Runner-Up to the less-capable Celestrons was the price. These Ultras demand more than double the cash outlay of the Skymasters. But if you are not price-sensitive, we urge you to consider these 15x70s.